Sussex County Rental Center now offers BOS Storage Containers for short-term and long-term rentals throughout Northern New Jersey. These portable steel storage containers are engineered with an easy interlocking assembly and require no tools for installation. BOS Containers offer versatile solutions for construction, fire and flood remediation, student and homeowner storage, just about anywhere portable storage is required. Detachable panels can be carried through tight spaces and assembled on site. Our portable wind and weather resistant units have a self-supporting structure, are stackable, and are light-weight yet strong. 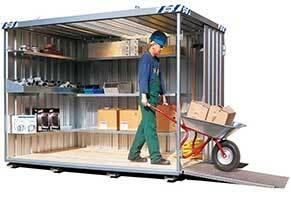 Full containers can be moved either by hoisting with a crane or carrying with a forklift. For more information, please contact a rental professional at 973-786-7700.